By default the reads are Illumina, paired with an insert size of 500. Click to Add File (blue box in Figure 2) and a file dialog will appear, select a read from a local directory and press OK. Preliminary checks on the read file such as size and fastq format will be carried out and you will be informed if the read is not acceptable. You can also right click on the Read File box and type the file name in directly, in this case the file will not be checked until it is uploaded. In addition to Illumina reads, high quality complete genomes can be added by trusted users. 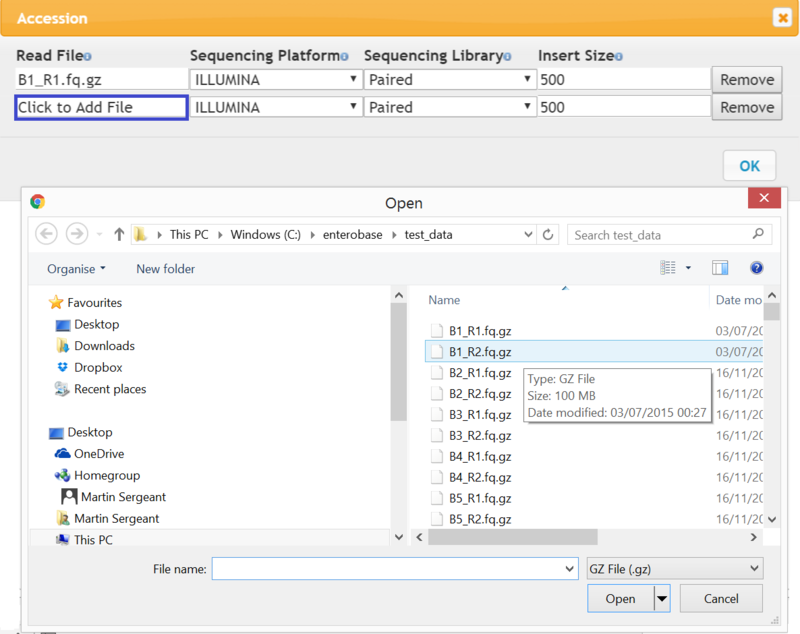 To do this, in the reads dialog remove one of the read entries and change Sequencing Platform to ‘Complete Genome’ and Sequencing Library to ‘Single’ and then add the appropriate file (.fasta) as above. When all the data has been filled in correctly, the Submit Data button will become active and can be pressed (blue box in Figure 1). You will then be taken to the Uploaded Reads Tab. The date should be in three columns, Collection Year (4 digits), Collection Month (1-12) and Collection Day (1-31). The reason for this is that excel will format date columns in unpredictable ways. Also if only one column represents the date, and only the year is entered, default values for month and day are added. If they are separate columns, it is much easier to add partial dates. To load the file, go to data > Load Local File and open the file. The data should appear in the table. If there are errors, mouse over the red cells to see what the problem is. When all errors have been corrected, the Submit Data (blue box - Figure 1) should become active. The Release Period input (Figure 1 red box) specifies the amount of time in months that your reads will remain private. This means that assemblies and annotation files cannot be downloaded by others unless you give them permission. Click the Add Directory button (blue box in Figure 3). A file chooser should then appear. In some browsers, you can just select the folder where the files reside, in others you have to select all the individual files that you want. Once the files have been located they should appear on the right hand of the screen with the status ‘pending’ and the Start Upload button will initiate the transfer. Bars which show the progress of each upload are displayed, as well as a bar which displays overall progress. You need to remain on the page until all the reads are uploaded. However, if the there is a loss in connectivity or another interruption, you can simply refresh the page and upload any remaining reads. Note Due to security restrictions, if you refresh or return the page you will have re-associate your reads by either the Add Directory button or by Drag and Drop. If want to delete the metadata that you have uploaded, select the rows you want to delete (shift + click to select multiple reads) and right click > ‘Delete Selected Row’ . You cannot delete rows associated with reads that are already being being processed. If you have a large number of reads to upload please contact us after you have added the metadata and we can arrange upload to an FTP site. I your assembly failed QC, or you have better quality reads for a strain that you previously uploaded into Enterobase, then you have two options. On the Main Search page, in the right hand grid, right click on the assembly that you own and select ‘Associate New Reads’. Enter the names of the new read files in the dialog and press submit. These reads can then be uploaded by going to the Upload Page (see above) in the normal way. If your reads have successfully uploaded, you can check they are being assembled by going to the My Jobs page. If there are no jobs displayed here, go back to the the Upload Reads tab of the upload page and check whether the status is Awaiting Upload - If so the reads have not been uploaded and you need to retry uploading them If after you have associated local files (by clicking Add Directory or drag and drop) they do not appear on the right hand of the page, then check that the names of the files in the left hand table exactly match the ones you are trying to associate.